I love thrillers but my writing is mostly non-fiction on history and politics. 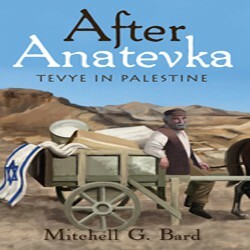 After Anatevka: Tevye in Palestine is my first novel and it will make you laugh and cry. When the authorities came with their little piece of paper telling us we had to leave Anatevka, the place we called our home all our lives, we had to sell whatever we could and take only what we needed on our journey to the promised land they call America. Instead of reclining in my rocking chair and reading to the children, poor old Tevye is slumping on this tree stump talking to himself about his misery. It’s not as though I’m suffering alone. You can hear the muttering and sobbing down the road as our little band of refugees sloshes through the mud toward an uncertain future. Look what has become of my family. Their clothes are already tattered and their faces sooty from the dust kicked up during the days of walking. My Golde has the strength of an ox, not to mention the disposition, but she will not protest in front of the children. That bag she’s shifting from one shoulder to the other holds all our remaining clothes. Her voice carries over the racket of our little multitude and pierces the air like a shrill bird. When I think about Golde and her pots and pans rattling on the old stove I can almost taste her cabbage borscht. The memory just makes me hungry, and the pots and pans don’t satisfy me. What they do is weigh down the cart. I’m so exhausted I’d fall off this stump if I closed my eyes for a second. We can’t afford to rest, though, with the sky darkening. About the only thing that would make matters worse would be for it to rain before we find shelter. Should I bother the Almighty with a request as trivial as keeping my family dry? No, there are more serious questions to ask. Do you think God is listening to me? As if He has nothing more important to do than listen to my problems.